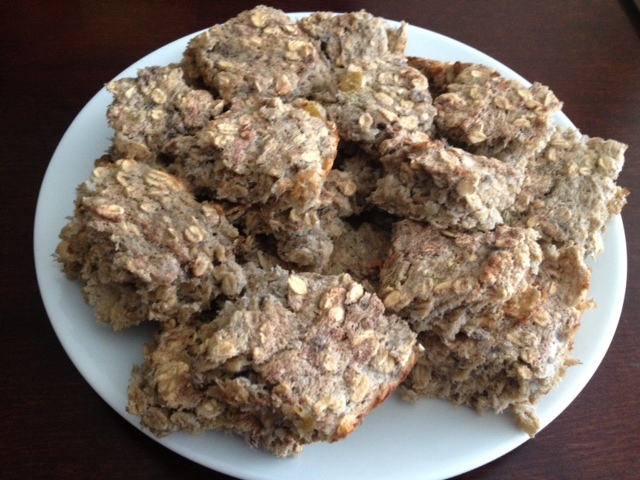 Gluten-Free, Low-Fat Banana Raisin Oat Squares. I don’t bake often, but I saw a similar recipe to this on an Instagram fitness blog that I follow and was excited to bake these up! 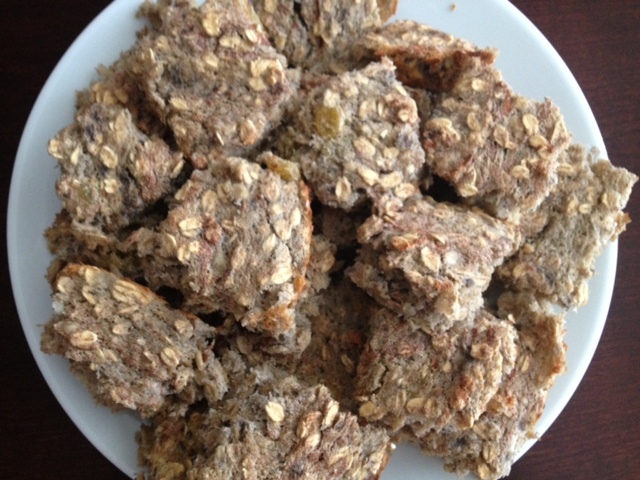 They may not be the prettiest, but they are a great, healthy, protein-packed breakfast or pre-workout snack. They are gluten-free and have no added oil, butter or sugar. I made enough to have for a whole week, but you could certainly scale the recipe down as well if you just want a few. These have given me a ton of energy to work out this week and I’ll definitely be making them again! Peal and chop the bananas and put them in the microwave for about 1 minute to heat them up a bit. After they come out of the microwave, place them in your mixer on high-speed to blend them to a smooth consistency. Once there are no lumps or bumps, add in the eggs, egg whites, oats and raisins and continue to mix on medium speed. When everything is combined, pour the mixture into a large, shallow baking dish (or you could do a muffin pan if you prefer) and sprinkle on cinnamon over the top. Bake in a 375 degree oven for about 25 minutes, or until lightly browned and firm to the touch.